I have touched upon my book club in a few different posts over the years, one of my readers asked that I expand on the history of our book club and how our club works. Our club, Reading between the wines' was formed March of 2010. After a major battle with my health (you can read my story here), I decided to take back my life and begin enjoying all things I loved and missed out on while sick, this included starting Sunday Morning Banana Pancakes and forming a book club. The very first book club pick was The Shack, one of my favorite reads to date. During this first gathering we decided, as a group, the frequency in which we would meet - it was decided that every other month would be a great start. Our last scheduled read of the year is scheduled for September/October, given the business of the holiday season we opt not to meet in November & December, joining back up for January/February. During our next club meeting a name was decided upon - that was easy, we love wine and reading, thus reading between the wines' was meant born! Our club is on the smaller side, we have about 5-6 consistent members with a few that drop in once or twice a year. Book pick turns are rotated between members, the person who selects the book also hosts the gathering. Our get togethers take place the 3rd Tuesday of every other month, we keep a running list of what books selected along with who choose them & the month they hosted. I love looking back at the books we have read as a group and recalling the conversations the book inspired, the ladies that make up our group are all very opinionated and bright which makes for great conversation! Along with excellent conversation, good company and plenty of spirits, there is never any shortage of excellent food too nosh on. We started to theme our potlucks around the book and/or season the meeting took place in. 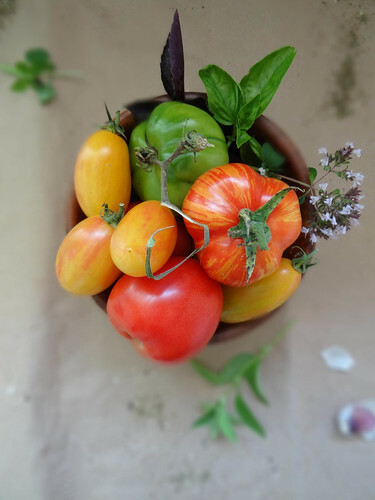 Our theme for August " Share your favorite Summer Inspired Appetizer!" 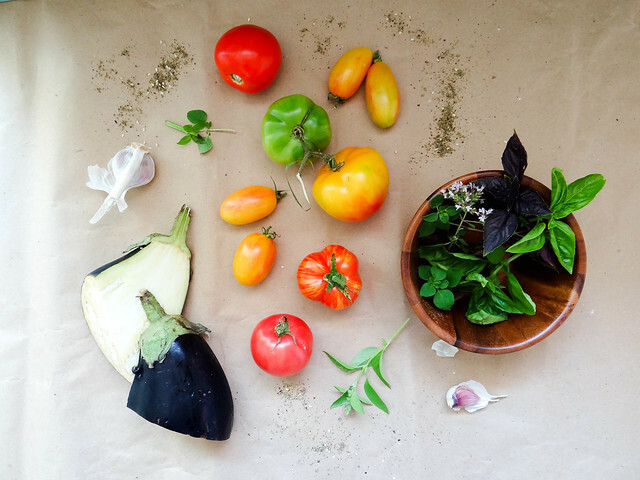 - for me, anything to do with in season veggies is a favorite. 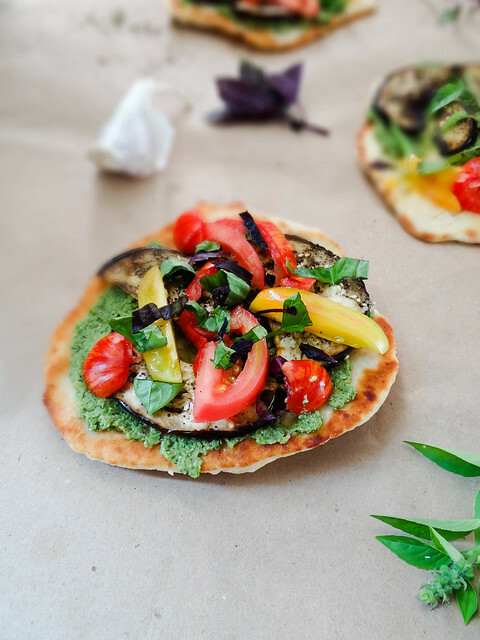 I shared with you last Thursday these super adorable crudites and today I am sharing with you an amazing garlicky naan flat bread recipe topped with a ton of summer flavor. 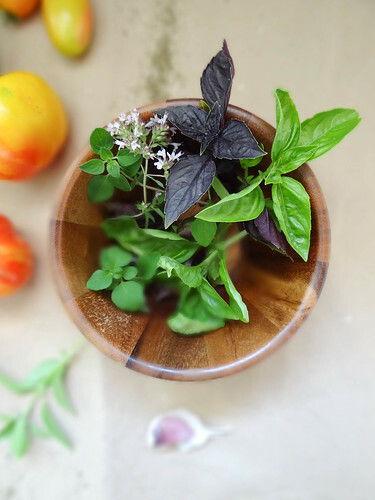 Basil has found its way into most of my meals these days, this recipe was a perfect way to use up some of the basil surplus I currently have in the Garden in 2 different ways; fresh & in the form of pesto. Za'atar is a middle eastern spice that was introduced to me by my Lebanese friend. A combination of dried herbs; sumac, thyme, savory, oregano & sesame seeds along with a bit of salt creates an amazing spice blend referred to as Za'atar, if you can find it I highly recommend stocking it in your pantry. Each side of the eggplant is generously sprinkled with salt and za'atar then baked until soft and golden. Making your own naan is ridiculously simple, from start to finish a batch of naan takes me about 15 minutes, which includes the kneading, resting and shaping time. 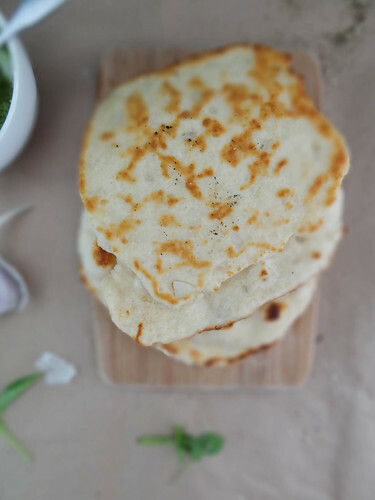 Naan flat bread is a great alternative to pizza crust and requires only a burner or grille versus an oven. 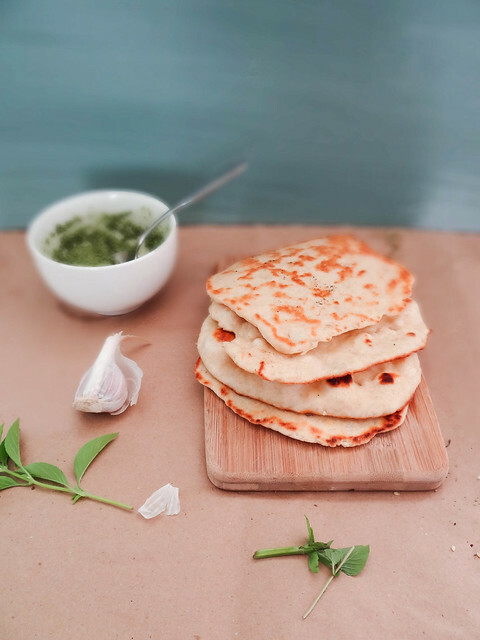 No excuses, if you don't have the motivation to make the full fledged flat bread recipe, at least make the garlicky naan! Are you a member or creator of a book club or simply a lover of literature, if you are I would love to hear about your book club experiences or favorites reads in the comments below! 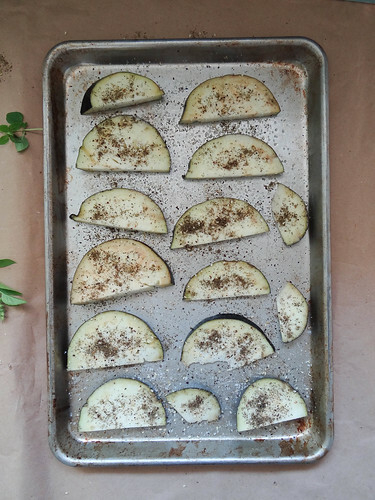 Place the half rounds of eggplant on an oiled rimmed baking sheet , salt & season both side with Za'atar. Spray with olive oil & roast in the oven for 15-20 minutes. In a medium mixing bowl, sift together the flour, baking powder and salt. With a wooden spoon, stir in the soygurt & garlic until flour is well moistened. Dust your surface with flour and turn out dough, use enough flour to keep your hands from sticking when kneading the dough. Knead until you achieve a smooth round ball. Using a knife or dough scraper, divide the ball of dough into 4 equal pieces. Working with 1 section at a time, covering the remaining dough - dust a rolling pin and work surface with flour and roll your dough out into a round - turning as you roll to prevent dough from sticking. Roll to the thickness of your liking. Repeat with the three remaining sections of dough until you have 4 rounds. Heat a medium frying pan over medium/ high heat- you may need adjust the heat throughout the process to ensure the pan does not run too hot. I typically start on medium/high and then adjust down to medium/low. Place a dot of vegan butter & coconut oil in the pan, working quickly swirl the butter/oil in the pan and add one round of dough - cover with a tight fitting lid which will create steam. Cook for about a minute or until the underside of the flatbread is spotted golden brown- flip, cover and cook the other side for about 30-45 seconds. Transfer flatbread to a plate and repeat the process for remaining flatbreads. 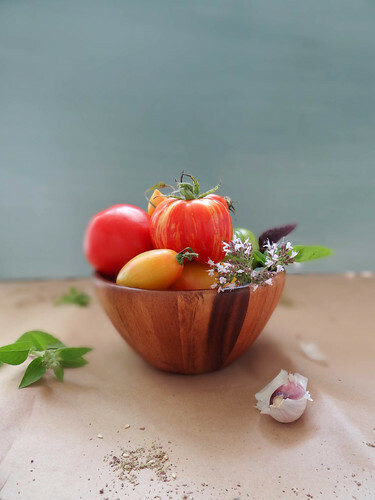 *The flatbreads can be made with whole wheat flour, spelt flour or all purpose flour - I have made the flatbreads with all three of these flours with great success. 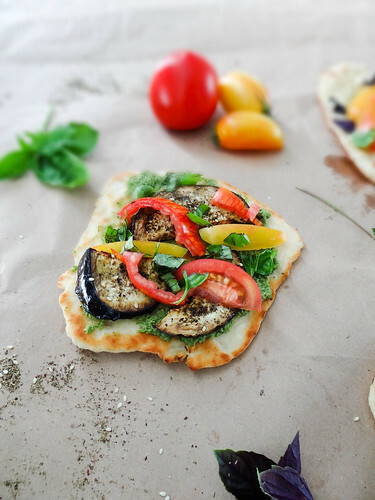 Spread each naan with prepared pesto, top with roasted eggplant, tomatoes and basil. Serve at room temp or store in the fridge until ready to serve, re warm in a 170* oven for 10 minutes prior to serving. i'd love to be part of a book club someday. i love to read and just don't get around to doing it very often (or ever), especially recently. also, i don't think i've ever tasted za'taar spice before... i need to try it! 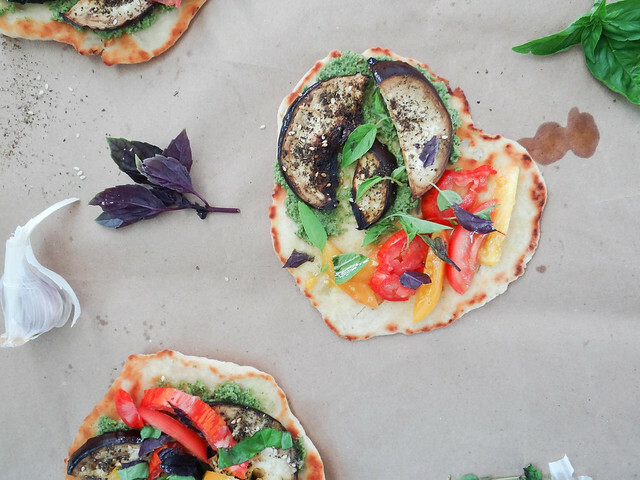 You definitely have to try za'atar out I bet you would love it! This time of year is the only time I ever cook with eggplant- by the end of August I am usually egg-planted out! 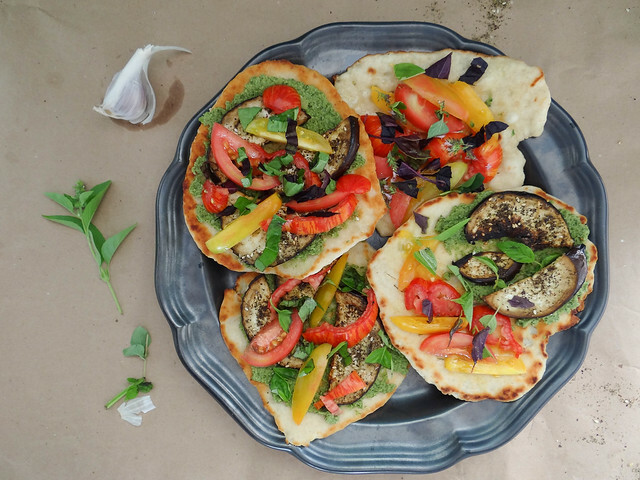 This recipe has everything I love: naan, tomatoes, Za'atar and eggplants! WOW!! I will definitely try it as soon as our backyard eggplants get ripe. I have 2 little eggplants growing out in the garden, I hope you enjoy this as much as we did! I love the idea of joining (or starting!) a book club. My Mum is part of one and really enjoys it. Plus, another opportunity to make and share food with others is nice bonus! Starting up a book club was one of the best things I decided to do, I love being able to talk about the books I read and the great food- can't wait to check out your recipe! I am all over this! Such a fun dinner idea! So much fun and super easy! Loved going through your blog, your book club sounds like a well deserved "you" night! Oh no Richa that makes me sad to hear! We still have beautiful days but it is getting darker too soon for my liking! Starting a book club was one of the best decisions I have made! Isn't zataar amazing, I am in love with the stuff! I have always wanted to join a book club, but I am so bad at keeping up with a book... I love reading, but I usually have a few books going at a time and it takes me forever to finish any of them. It sounds like so much fun to be a part of a club like yours, though -- meeting, discussing the books, eating good food... sounds good to me! I've never tried za'atar before, but I've been curious about it for a while know. It sounds awesome with the naan and eggplant -- yum! I've never joined a book club because I like to read books on my own schedule, but yours does sound fun - especially with the food aspect! 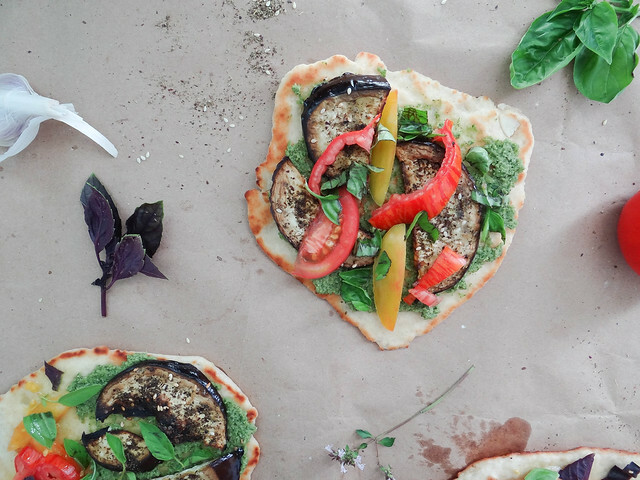 I've been wanting to try making something with zaatar, and pairing it with eggplant and pesto sounds perfect! I never had that kind of stuff before! that looks interesting i'll try this recipe in coming weekends!